Arguably #3 might be most important for app providers, while #1 and/or #2 might be more important for app users. 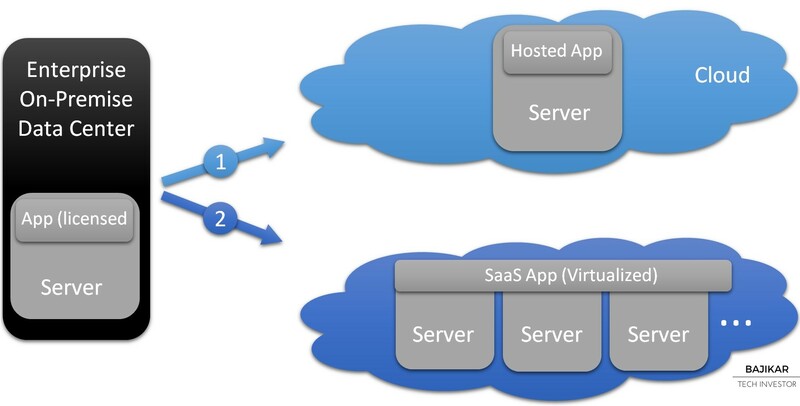 The chart illustrates two approaches to providing Cloud-based apps on a subscription basis. Approach #1 simply relocates the app from its on-premise home within an enterprise to a (public) Cloud, with minimal other architectural changes to the app. Approach #2 takes it a step further by virtualizing the app in the Cloud, so that it can run on-demand across a range of servers (or data centers) within the reach of the overarching Cloud. Such an approach can provide better scalability for an app-user, as business grows. After first dismissing threat from the Cloud, Oracle over the last couple of years has aggressively messaged a story highlighting its rapid progress in delivering SaaS solutions. Within the framework of the above chart, Oracle’s messaging implies that it has transformed most of its software offerings to Cloud-based solutions using approach #2. I do not know if that is actually the case – chances are that it isn’t. Still, merely shifting from an on-premise licensed model to a Cloud-based subscription model can provide benefits (#1 & #3) to the customer and to the provider. So the architectural debate about exactly which approach Oracle is using for its Cloud offerings becomes moot, unless a potent disruptor arises. 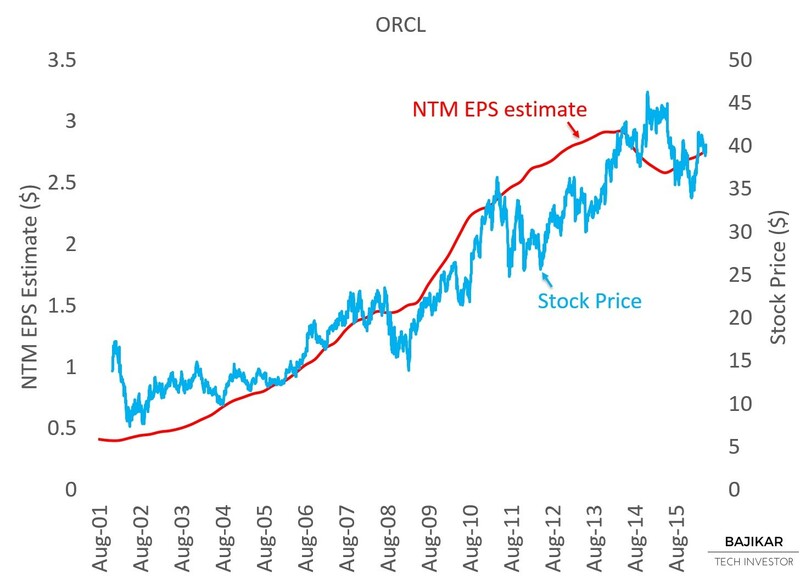 The stock price vs. NTM EPS chart below suggests ORCL is not significantly mispriced at current levels, with a generally favorable outlook. The P/E vs. 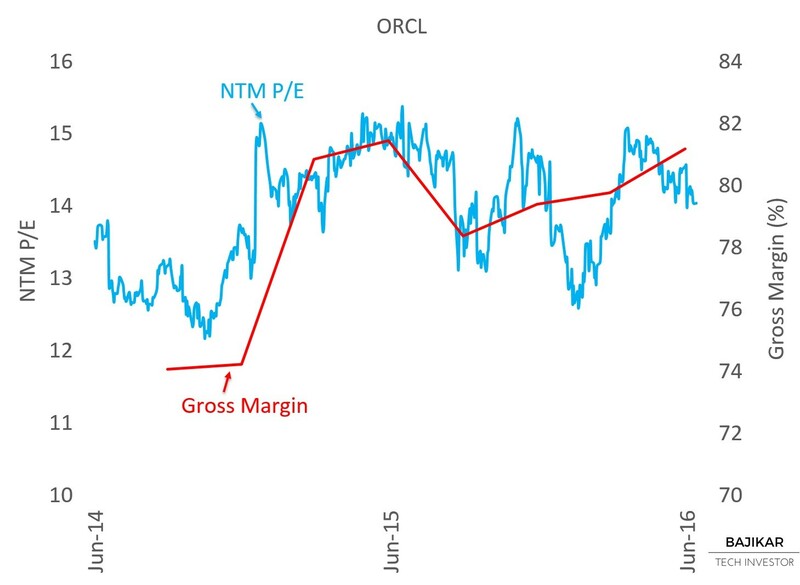 Revenues YoY chart below suggests ORCL’s P/E multiple might be trending near the higher end of its recent range. While P/E tracked Revenues YoY more closely in the past, the two variables seem to have diverged recently. In other words, revenue growth (or lack thereof) is probably not telling the whole story of the stock. The chart below suggests that over the last couple of years, ORCL’s P/E has tracked gross margins more closely than Revenues YoY. 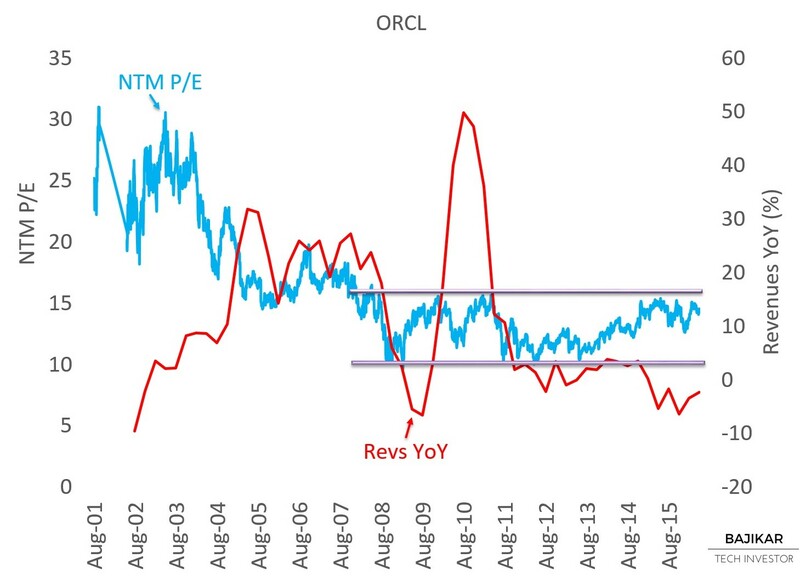 On that basis, ORCL’s P/E also does not look severely mispriced at current levels. If gross margins claw back to their historical highs in the mid-80%s, P/E could rerate higher by a couple of turns or so. Given lack of obvious or severe mispricing, there isn’t a clear buy or sell signal here on the basis of these frameworks. That would put ORCL in the “Hold” bucket for now, until better opportunities arise. 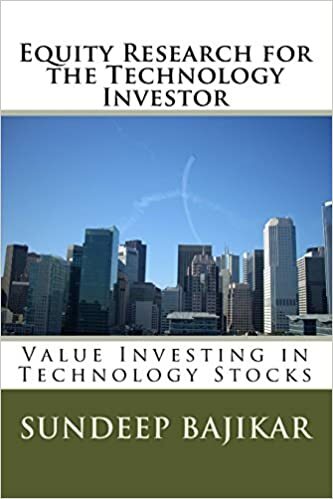 Disclosure: At the time of this writing, the acteve Model Portfolio did not hold a position in ORCL stock.